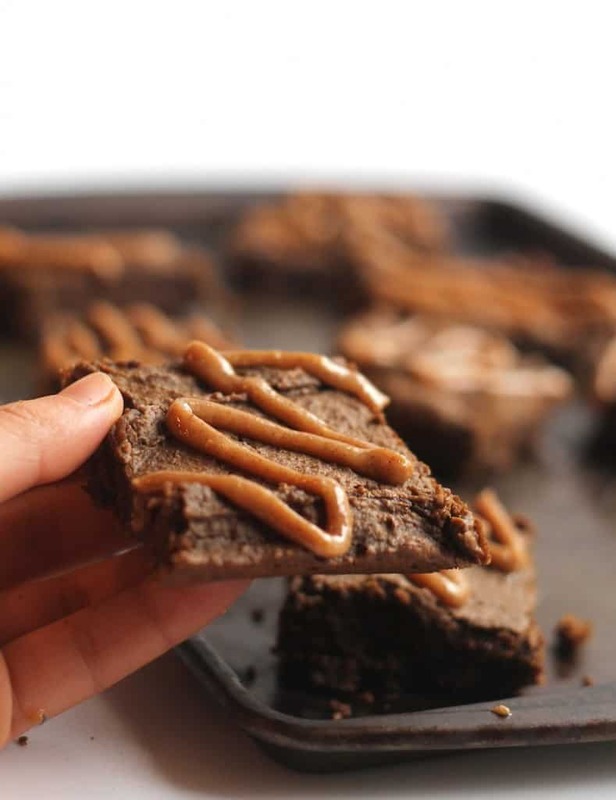 Flourless gingerbread blondies made with high-protein chickpeas! These vegan and gluten-free snack bars make the perfect healthy treat for kids and adults alike. These ginga’ bread blondies are like warm fuzzy slippers—but for your piehole instead of your feet. Like, they were made for your mouth. One size fits all. Universally delish. The best kind. As a devoted legume lover, I consider it my duty to continuously praise the beloved chickpea and showcase its versatility. I betcha never thought of making flourless gingerbread noms out of good old garbanzos, did ya? Me either, that is until I saw blackstrap molasses at Whole Foods. It was love at first sight. Did you know that one tablespoon of the stuff has 20% of the daily value of iron AND calcium? I love this so much because those are both minerals that people associate with animal products like milk and beef. The truth is that you can get oodles of both of those nutrients (in addition to a plethora of phytonutrients) from numerous plant sources like leafy green veggies, lentils, legumes, and dried fruit. Thanks to its mild flavor and velvety texture, cashew buttah gives these blondies that spot-on cookie flavor. 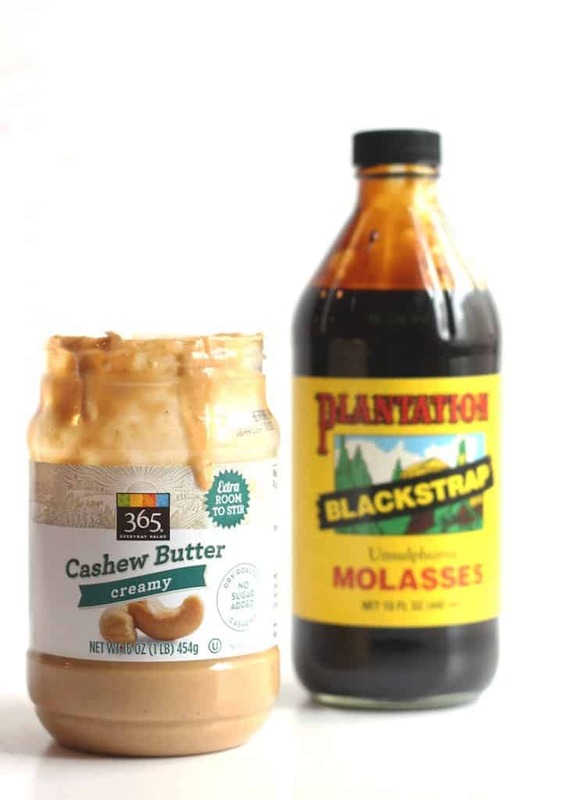 It’s popping up in stores everywhere, but feel free to sub in almond butter if you can’t find it.With all that extra molasses, you should most definitely whip up a …just sayin. With all that extra molasses, you should most definitely whip up a sweet potato gingerbread smoothie…just sayin. I was debating whether to call these bars or blondies, but blondies sounded so much more fun. The truth is that I don’t even really know what a blondie is. In fact, these look much more like brunetties if you ask me. Maybe I’m just biased. 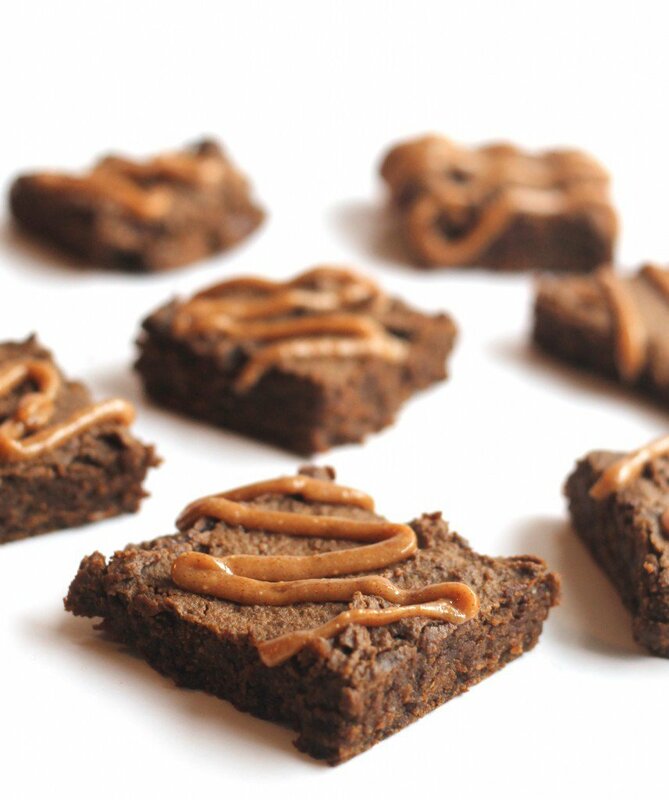 I’m always telling my nutrition counseling clients to ditch the goodies made with refined sugar and flour and whip up some naturally sweetened treats at home. While these bad boys have a bit of maple syrup and molasses, the bottom line is that they’re made with fiber-rich chickpeas that actually help regulate blood sugar rather than the evil white stuff that elevates it. It’s always a smart choice to pair sugary foods with high fiber foods in order to lessen the impact on your blood sugar. AKA the answer to all of your blood sugar problems are gingerbread chickpea blondies. Preheat oven to 350 F. Spray an 8×8 inch pan with cooking spray or coconut oil. Add all ingredients except those for glaze in a large food processor and process until batter is very smooth, about two to three minutes. Spread batter evenly in prepared pan. Use a spatula sprayed with cooing spray to evenly press mixture into pan. Bake for about 25 minutes, or until a knife comes out clean. Meanwhile, place glaze ingredients in a small bowl. Stir with a fork until well combined. The coconut oil should slightly melt as you stir. Set aside until the bars have cooled. Cool bars in pan for 30 minutes on a wire rack before cutting into 9-12 bars. Snip corner of the glaze bag. Drizzle glaze onto bars. Can’t get enough chickpeas? Story of my life. Try one of these! These blondes sound fabulous! Blondies are my favorite baked good, hands down. Blondies* not blondes. I hate autocorrect on the computer, haha. the flavors in these sound to die for girl!! Whatttttt? Girl, you’re making me want to trek through #stormaggedon right now to go buy molasses and make these. I need something gingerbread in my life! Also, cashew butter is basically my kryptoninte. Yummmm. Yummmmm! Now I really really need to go buy molasses, so many great recipes right now with molasses! These sound perfect! I’m gingerbread obsessed and I have extra cashew butter that I wanted to use in a recipe. I’m so happy you created these, can’t wait to try this recipe out. These sound like I need them right now! I love baking with chickpeas! It makes for such a great texture :) I need to pick up some molasses! Yay! I seriously had this same idea the other night but didn’t know the best way to execute it! Going to try baking them tonight!! I am OBSESSED with their cashew butter! I love that you used it in this recipe! I love using chickpeas in baking – it is just amazing. 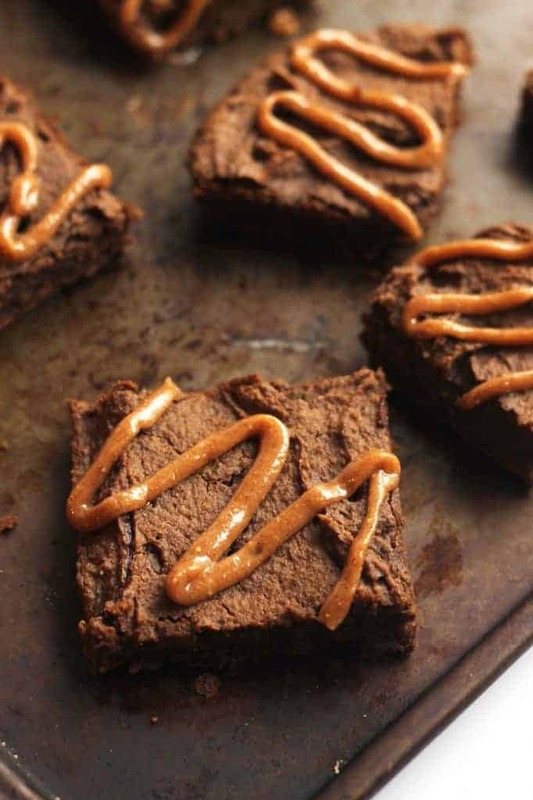 Paired with cashew butter – oh hello! That stuff is so flipping good!! Yup, I’m not bad about these. Always great recipes! I KNEW you had the solution to all my problems ;) Now if only these blondies would pitch in and help me paint my new house… ;) (At least they could be the sweet treat to reward my friends for helping!!). I think what you guys call Blondies, we call ‘slices’ here in Australia but blondies sound so much cooler. Or brunetties. Or Albinottis. (When I make a white chocolate one). I still need to post my hummusapien recipe. It’s cray. As if I couldn’t love chickpeas enough I had to see these tasty morsels of goodness! These are perfect! 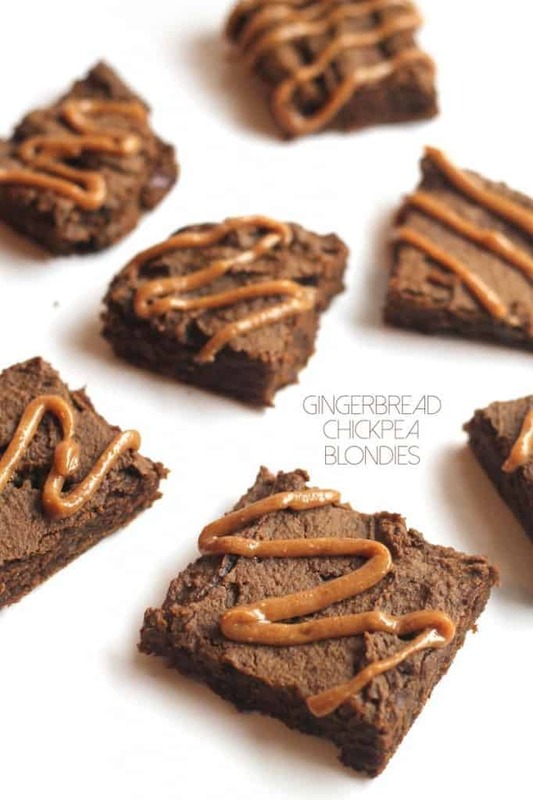 ” the answer to all of your blood sugar problems are gingerbread chickpea blondies.” . and what a sweeeet answer it’d be. Also, I believe there really are NEVER enough chickpeas – or not in my life – so I’ll embrace any way to eat more of them. Especially if it means I also get away with eating more chocolate. You know what’s good. Cashew butter is amazing in baked goods. I like to use cashew milk too. Now if only they’d come out with cashew extract we would have heaven! Are they still one size fits all if I shove 5 of them in my mouth at once? I figure I’ve been running low on iron and calcium lately, so I may as well re-fuel via molasses blondies. I have been craving gingerbread eeee’erythang recently, so I’m thinking yes to these ‘banzo bars! LOVE these!! So easy to make and very seriously good. I made them for a work party and they all went! Some people asked for the recipe and they were so shocked to see that chickpeas were in there! Thanks Lexis! I made these the other day and OH MY GOSH- so good! I added 2 scoops of SunWarrior and some egg whites to pump up the protein, and they turned out incredible! Awesome! Fab idea to add protein! and happenings of their life which may ruin the happiness in the coming future. People are not to be trusted these days and you cannot simply blame yourself for following your instincts. telephone contact but simply turned on. however this piece of writing presents nice understanding even.